Make your old fashioned countertop look like a newly installed granite granite countertop at a fraction of the cost. "I just finished using your refinishing kit on my kitchen counters. I just had to let you know how pleased I am with your product. I have 1980's formica counters that were in pretty good shape but they just looked old and outdated. I have tried two different products and was not happy with the results. I was about to give up and shell out money for new counters when I found your website. What luck! I purchased the brownstone kit. When I first applied the granite paint I thought I received the wrong color but when it dried it looked amazing. I cannot tell you how happy I am with the results. It was so easy to apply and the results are incredible. Thank you so much. I just love my kitchen now. My sister-in-law was so impressed with the results that she will be ordering a kit for herself". Here's another comment from a happy customer and some pictures of her finished counter in Terrain. "We love our new counters! It worked just as you said it would. Hope these pictures show how ugly our harvest gold 70's compared to our new "granite" counters were3. We only wish we purchased the thicker topcoat. I understand we get a credit for sending pictures,we'll order the better topcoat at that time. 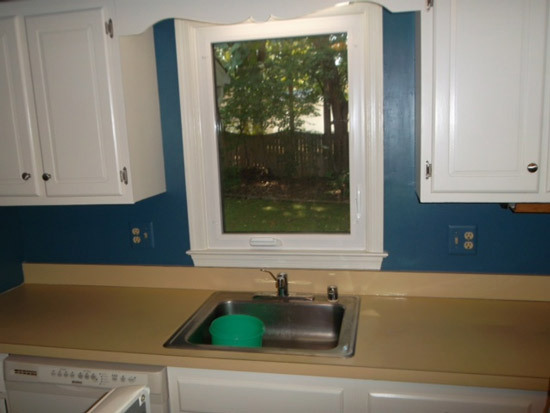 From Sandy W: "Last year I scoured the internet trying to find an affordable option to update my kitchen countertops. I didn't want new laminate and granite or other stone counters were out of the question. I found a couple 'resurfacing' ideas online but kept coming back to the Armor Garage website and must have looked at the pictures and color samples a hundred times before taking the leap and ordering Ridge Rock with the extra thick topcoat. The process really could not have been easier. The hardest part was having the patience to wait between steps! 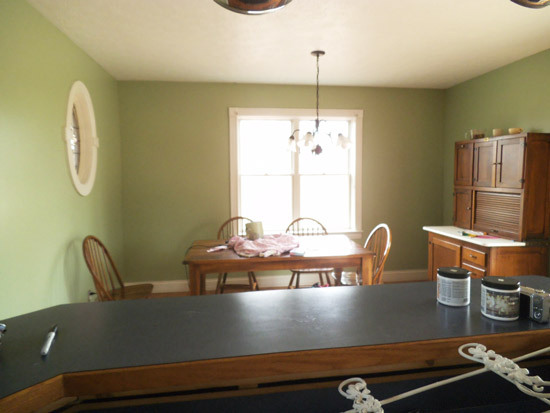 My counters were dark blue laminate and had wood trim that I was beginning to despise. Now, people can't believe the difference and how awesome my counters look. It is such realistic granite look that if I didn't tell them they weren't real I don't think they would even notice. My countertops are BEAUTIFUL and now I LOVE the beveled edge of the covered wood trim that I used to hate! 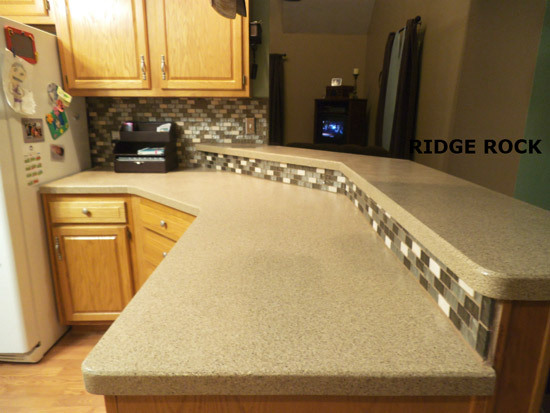 I think the Ridge Rock color is perfect if you're going for a neutral look to work the rest of your kitchen around." 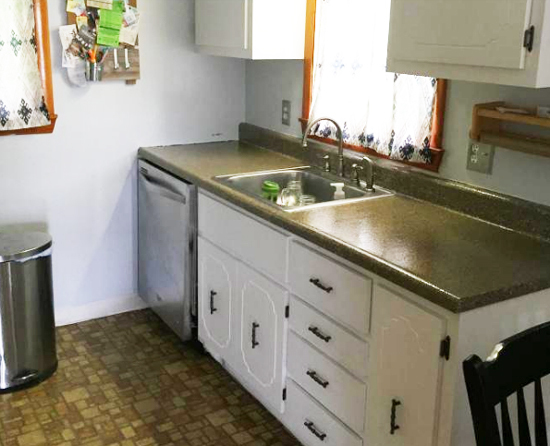 "I purchased Amor Garage over 3 years ago with hopes of refinishing some badly worn formica counter tops in my then 29 year old kitchen. I think the color was Summit Gray. I was very apprehensive about the cost, quality and ease of application. To my surprise and pleasure the counter top paint when applied per the instructions went on evenly and looked like a random stone finish. Any application error made was mine, but easily corrected. I have been pleased with its durability and have had no chipping issues. I do wish I had purchased the thicker top coat, but I may do that in the near future. I have recommended this product to many of my friends who want to update their counter tops. By the way, I used a different brand on my bathroom counter tops, but hands down prefer Amor Garage. I had enough paint left over to share with my daughter who refinished her bathroom vanity counter top. A friend, who's a general contractor, just saw the counter tops and wanted to know what company replaced them. He was shocked that the finish was a DIY product! This review may be considered outdated, but it proves Amor Garage does stand the test of time. Thanks for a great product. 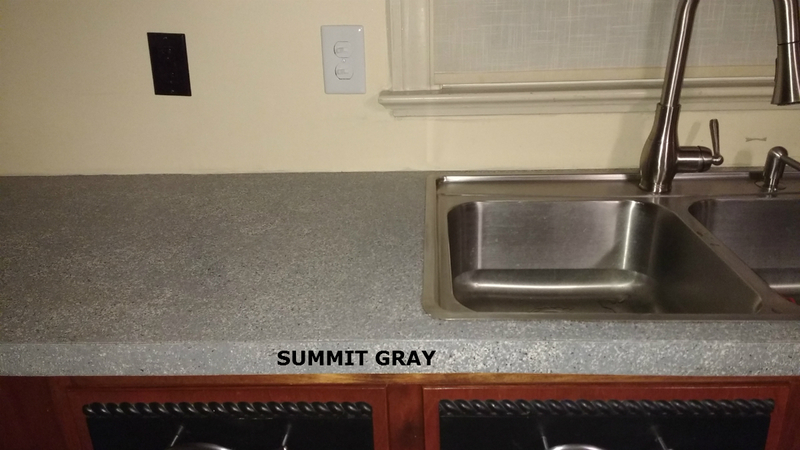 Although ArmorGranite epoxy countertops may cost a few dollars more, they guarantee you a finish that has the depth, high luster, and smooth texture found in real granite stone with a form anyone can easily apply. Our bathroom and kitchen countertop refinishing kit is ideal for countertops, back splashes, and even entire walls.This is a Premium Quality refinishing kit that will provide a permanent new look to just about any countertop surface in your kitchen or bathroom. Not to be confused with bathtub or tile refinishing kits. 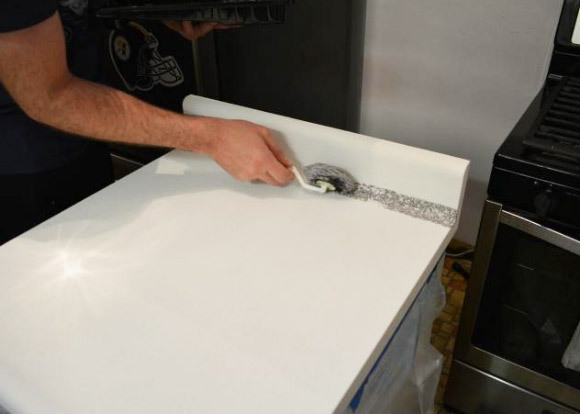 Using our countertop refinishing kits is easy! First, apply the primer and let it dry for one to two hours. 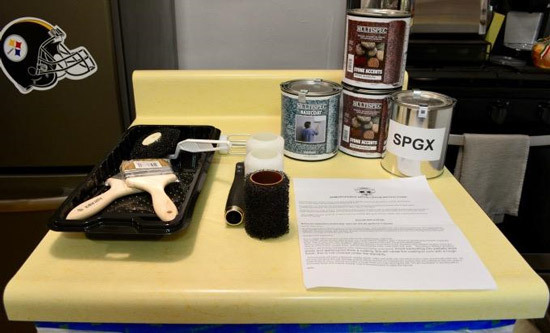 Then, apply our granite epoxy using the special roller included in the kit to automatically create the granite effect and leave nothing to chance. After letting it dry overnight, apply two coats of our standard stone clear topcoat on the surface. Alternatively, you can apply a single coating of the extra thick version of our clear coat to provide that high polished granite look with a bartop smooth durable surface. 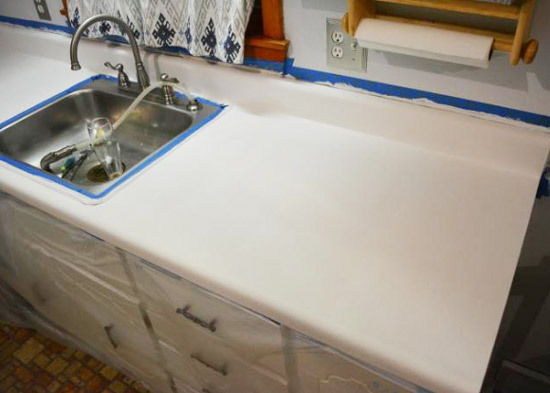 No need to worry about our epoxy countertops chipping or flaking off as with other cheap refinishing kits. 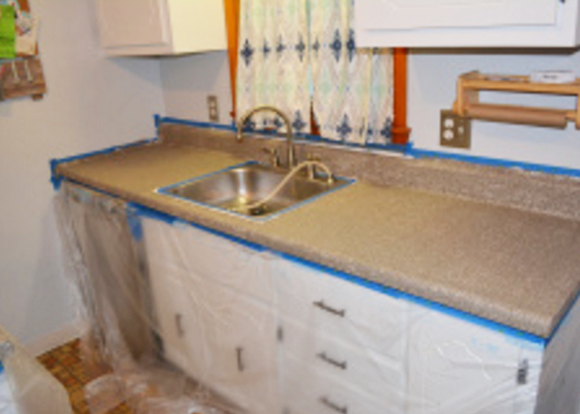 Refinished kitchen countertops made with our kits are also highly resistant to scratches, cuts, and heat! And while cheap kits are paper thin and never last, Armor Granite kits are 100 mils thick20 times thicker than any other kitchen epoxy kit on the market! 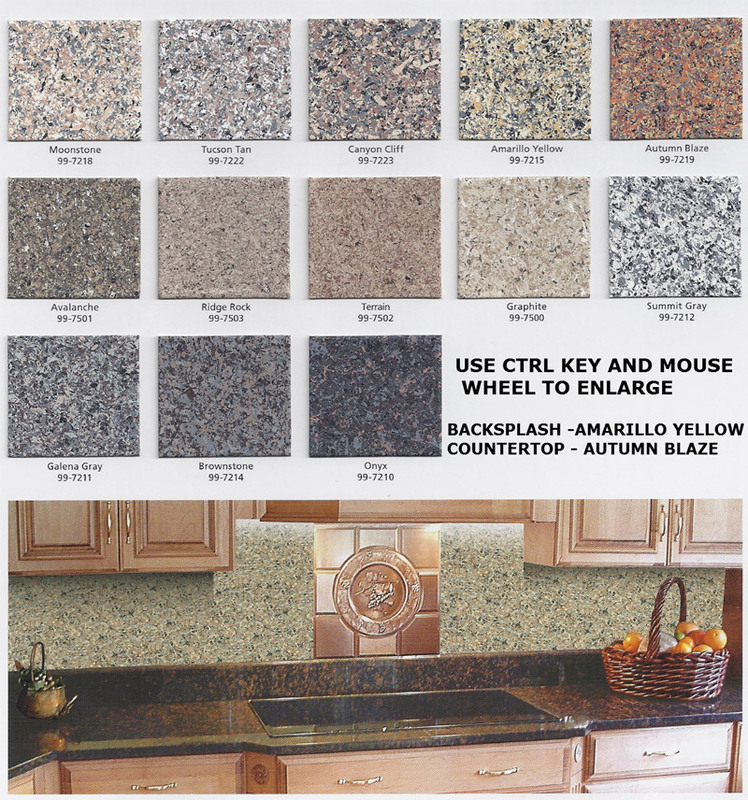 Armor Granite countertop refinishing kits are affordable and less costly than new laminates. Furthermore, you don't need to have special artistic skills to use our kits. You also don't have to worry about working with special chemicals and sprinkling in special effects since the effects are already built into the paint. Armor Granite kitchen countertop epoxy leaves nothing to chance, guaranteeing you a perfect finish every time! FOR COMPLETE COLOR CHART, APPLICATION INSTRUCTIONS CLICK ON THE PRODUCT IMAGES ABOVE. 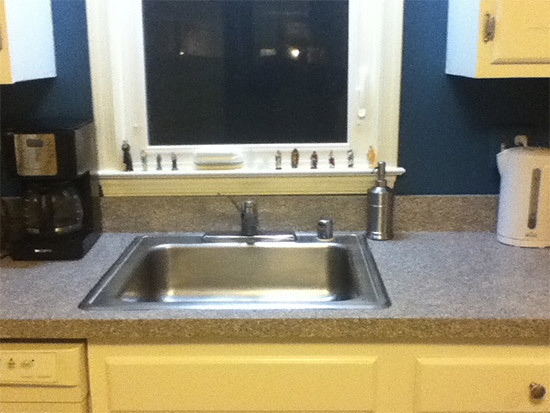 SEND US PICTURES OF YOUR FINISHED COUNTERTOP AND RECEIVE A $30.00 CREDIT! Standard kits ship out in 2-3 business days. ALSO SEE OUR BATHROOM EPOXY REFINISHING KIT. Coverage is 50 sq. ft. based on smooth, non-porous surfaces. Irregular or porous surfaces such as cinder block may require greater quantities per square foot. Below is an in depth review from our customer Kayla who was kind enough to document her entire experience with our kitchen countertop epoxy kit from her initial search for a product, installing it, to the product in actual use after several weeks of it being installed. We think this in addition to our standard and now seemingly dull instructions that you can find on the actual Product Page will give you all the information you need to know about the quality of our product and what's involved in applying a new finish to your kitchen countertop. If you're just joining us, I've been documenting the our average kitchen refresh. Today is a big deal because today is all about my favorite update, the countertops, AND a review of a pretty awesome product from Armor Garage. I probably spent the most time researching what to do about the countertops than I did on all the other projects we tackled combined. First, we considered just replaced them completely. After a few hours on Home Depot's website, trips to Lowe's and Home Depot, we decided it wasn't worth the time or money. Plus, we reasoned that the counter tops were still in very good condition; no cracks, no stains, no water damage. I moved on to counter top resurfacing/refinishing/making less ugly kits. The price point was more reasonable and we would be the labor so we could save there too. Once I started looking into them and reading reviews, I was still on the fence. I didn't want to learn a painting technique. The Rustoleum kits are popular but the actual process was a nightmare.You put on a coat of adhesive and then dump a bajillion and one tiny pieces of "granite" onto it. You put on so much, in fact, that you are required to VACUUM UP the extra. Nope, nope, NOPE. I knew I would have tiny pieces of granite all over my house and in everything for the rest of forever. Plus, with all the sanding, dumping, sanding, more vacuuming, and finally sealing it would mean the kitchen would be shut down for the rest of forever too. I kept reading reviews and there were so many reports of the poly top coat yellowing, staining easily, and the finished product chipping very easily. So after I did all that work and vacuuming, there really wasn't much of a guarantee that it would hold up to day to day use. My kid puts his cups in the sink by whipping them at it and his aim is not too fabulous. They will receive wear and tear. Finally, in the depths of the internet, I stumbled on Armor Garage and the clouds parted, the sun came out, and birds began to sing. Armor Garage specializes in industrial floor epoxy and garage flooring. Their floor coatings are military grade. Large vehicles, heavy equipment, airplanes, you name it- they all drive on top of their product every day. Clearly whatever product they offer needs to be tough, durable, and stain resistant. And they happened to offer a kitchen counter top kit. I started googling for reviews, pictures, tutorials and was surprised to not find very many. The ones I did find were excellent, as were all the before and after photos included on their website. I concluded that many people didn't look to a flooring company for a kitchen counter top resurfacing kit and sent an e-mail to the company with a few questions I had about the product. I explained that I hadn't been able to find many reviews, and that I would be more than happy to provide one after we completed our project. As it turned out, they have been wanting to add a step by step tutorial and asked me what color I wanted to use. Then they sent me a kit. Can we say customer service? when we taped. We also wiped down the counters to remove any grease, dirt, etc., that would keep the paint from adhering correctly. We had one shot at this, and weren't planning on messing up. Next, we taped off/covered anything that we didn't want covered in granite epoxy. We paid special attention around the edges of the sink and made sure there was a good seal. Finally, we were ready to PAINT! This was a huge moment for me. I may or may not have hovered with the camera and drove Mike a little crazy. I should also be clear that since Mike's painting skills > my painting skills, he was the official painter. I declared myself photographer, item fetcher, inspector, window opener/closer, and cheerleader. We used a brush to cut in first and followed up with the included 3 in. roller. The directions specify that the base coat is slightly textured and it's true. It dries with a finish that reminded me of plaster. We opted for two light coats to make sure we applied it evenly and covered completely and let it dry to the touch between coats. I was in love already. I was in love with a base coat. That, my friends, is how much I was ready to see the dreaded yellow go. Once those coats had thoroughly dried, we were ready to start the fun part- the granite epoxy! The directions warned that the paint would have a milky blue color out of the can and that is EXACTLY how I would describe it. Using the corner roller, Mike cut in small sections, and then rolled. We (meaning Mike), found it was easiest to go very slowly and we never had any splatter problems. The directions clearly stated to lift the roller when you came to the end of a stroke instead of rolling again. It kept it manageable. This coat took the longest to dry, but it was totally worth it. We just had to be sure to remember the edges and sides. This was also, in my opinion, the smelliest step. We didn't want to open windows or run fans that would stir up dust and dog hair so we got out our trusty plastic sheeting and created another kitchen crime scene. It kept the fumes in the kitchen and out of the rest of the house. We waited as long as we possibly could to let it dry; meaning even when we KNEW it was dry, we still held off on putting everything back a little bit longer. Mike touched up the paint around it and applied the new caulking in the meantime. The instructions said to let dry 24 hours, but we used an abundance of caution simply because they looked so much better and who wants to mess that up? Super Thick Rock Hard Polished Finish! Heat Resistant to 200 Degrees! Will Not Wear Off, Peel, Crack, Fade or Yellow! Easiest Countertop Refinishing Kit to Apply with Professional Results and No Odor! Food Safe. Three Easy Roller on Steps with No Flakes or Special Effects to Apply!